Composting reduces landfill, allowing biodegradable materials to breakdown naturally. Organic materials in landfill produce toxins when air cannot reach the biodegradable waste. composting saves money on landfill costs and chemical fertilizer. Composting is nature's process of recycling decomposed organic materials into a rich soil known as compost. Anything that was once living will decompose. Basically, backyard composting is an acceleration of the same process nature uses. By composting your organic waste you are returning nutrients back into the soil in order for the cycle of life to continue. Finished compost looks like soil - dark brown, crumbly and smells like a forest floor. Choose a location for your compost pile. It should be a level, well drained surface of bare earth at least two feet away from a structure. Add brown and green materials making sure larger pieces are chopped or shredded. 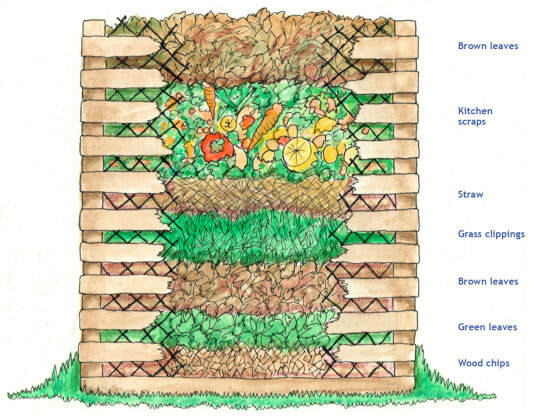 Ideally, your compost pile should have an equal amount of browns to greens and alternate layers of organic materials of different size particles. Moisten dry materials with water as they are added to your pile. Toss materials from the bottom to the top of the pile every three weeks. Once your compost pile is established, mix grass clippings and green waste into the pile and bury fruit and vegetable waste under to inches of compost material. Browns - includes materials such as dead leaves, branches and twigs. Greens - Includes materials such as grass clippings, vegetable waste, fruit scraps and coffee grounds. Your compost should be ready to use within 2 to 4 months. Using finished compost on your lawn and garden will add nutrients, suppress weeds and hold moisture in the soil.